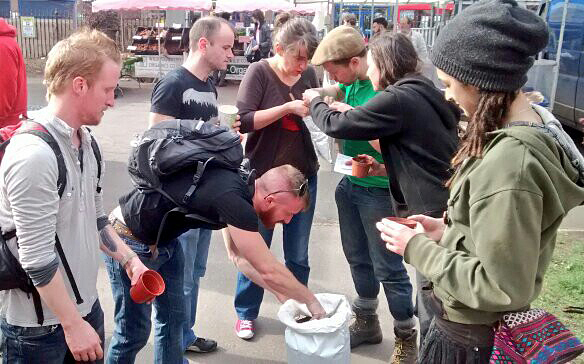 On Saturday 8th of March CFGN brought together a collection of seeds for swapping from community gardens around London, and to run ‘Seed-dating’ where people paired up to sow seeds into small pots together. Stoke Newington farmers market was drenched in early Spring sunshine as we set up the seed stall amongst fresh vegetables, fruits, and bread from local producers. Over the years we’ve run small seed swaps at different events and it was brilliant to see the broad selection of heritage varieties we’ve accumulated. These included Red Orach from OrganicLea, Pumpkin seeds from Grow Heathrow, Wheat from the Better Health Bakery, and Broad Beans from Wiesehoisl farm in Austria collected on the PEDAL caravan. 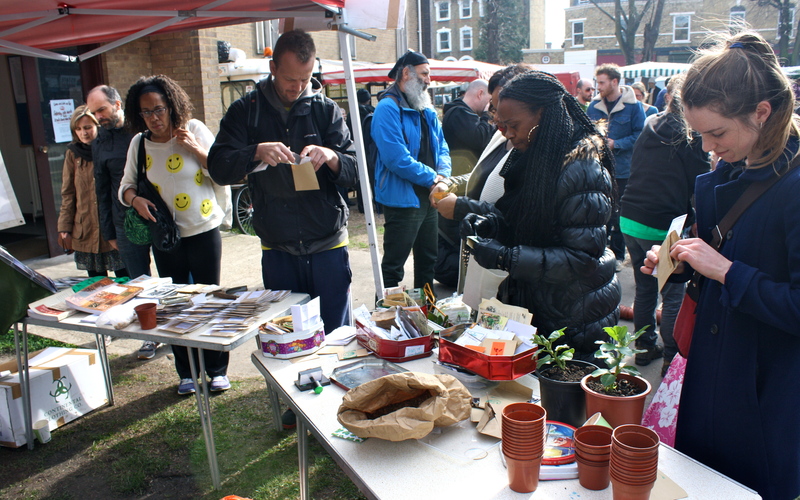 Importantly there were seeds from the Heygate Estate garden (formerly a member of CFGN) which now has been replaced by cranes and bulldozers as Southwark council has forced the community out to build luxury flats and unaffordable ‘affordable’ housing. 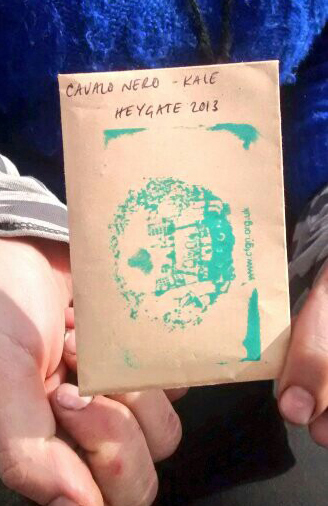 The stories from the Heygate garden, which contributed to people’s food in Elephant & Castle for years, can continue to exist as the seeds grow in gardens around London. Below is the the ‘Seedy News’ pamphlet that we distributed about the history of the practice and updates about the EU Plant Reproductive Material Law (PRM). Thanks for bringing so many great seeds- see you soon for more swapping! Seed swapping is a practice that has taken place for millennia. As growers save and give away seeds from good harvests, others get to experiment with these seeds and how they fare in different soil and climatic conditions. During this process varieties cross-pollinate and new varieties come about that offer different characteristics – such as improved yield or resilience to diseases. 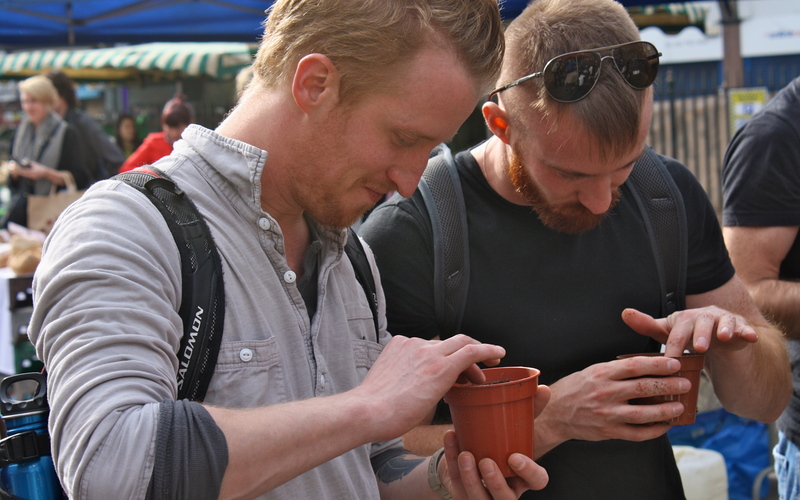 Farmers, growers and gardeners select the seeds from the best crops to grow and share. As varieties that evolve are found to better suit our needs, we tackle the issues faced by changing climatic conditions and have the potential to adapt to these changes. Research laboratories do essentially the same thing; however their objectives often go beyond the purpose of developing better seed. Many seed breeders are now funded by multinational seed companies whose primary interest lies in ensuring continued profitability by preventing farmers, growers and gardeners from saving their own seeds and ensuring they buy stock from the industry year on year. In the UK, this can be illustrated through the example of attempts to develop a genetically modified (GM) potato variety that resists blight by the John Innes Centre, who spent £3 million of public funds to do so. They ignored the fact that potato varieties with a resistance to blight have been developed through traditional breeding methods by the Sarvari Research Trust. Last year, when the GM potato was tested against other potato varieties, the Sarvari’s Sarpo varieties were deliberately left out of the study. Big money vested in the development of copyrighted plant propagation material undermines the cheaper and more equitable solutions available through traditional breeding methods. Both the Environment and the Agriculture Committees of the European Parliament voted by majority earlier this year to block the controversial seed bill, which will now have to be redrafted by the Commission. However this takes place in the context of ongoing Transatlantic Trade and Investment Partnership (TTIP) free-trade talks between the US and the EU and there is a very real threat of the EU plant reproductive material debates being drawn into these decisions. Movements to include the Plant Reproductive Materials Law (PRM) in the TTIP talks is symptomatic of a wider international move towards taking decisions about plant genetic resources away from public decision making which will make it even harder for farmers organizations to get their voices heard. Under TTIP agreements companies could by-pass national/European court systems and go directly to international, investor-biased tribunals. If a government bans genetically modified foods, or calls for a stronger regulation against patented seed varieties, companies could sue for loss of profits. Furthermore, if elements of the PRM Law are included in these free trade talks then it is possible that under non-discrimination regulations covering products of different origins, farmers may not be able to make the free choices over the type of seed they grow and other agricultural products the use, due to fear of prosecution in international courts and tribunals. Organisations such as La Via Campesina and the Landworkers’ Alliance highlight that this is in contravention of the International Seed Treaty, put in place to ensure plant genetic resources are protected and the benefits derived are equitably distributed. They argue that freely reproducible seeds are an inalienable part of our heritage, biodiversity and food security.What farmers, growers and gardeners need is a seed law that puts their rights to grow, save, and sell plant reproductive materials at the centre of the debate. In our current political situation the act of exchanging seeds takes on a political dimension, beyond the merely functional one. A lot of momentum has been built through coordinating campaigns for better regulation around seeds in recent years, and it is important that we keep this momentum going so we can defend the rights of farmers, growers and gardeners in future struggles. Organise and participate in seed swaps locally. Petition write to MPs/MEPs – demand that they listen to small-scale farmers organisations and resist the impending free trade agreements. Contribute to a Seed Bank support the work of organisations like the heritage seed library and the real seed company who are working to increase genetic diversity in vegetable seed. Stay in touch spread the word and come to other CFGN events.